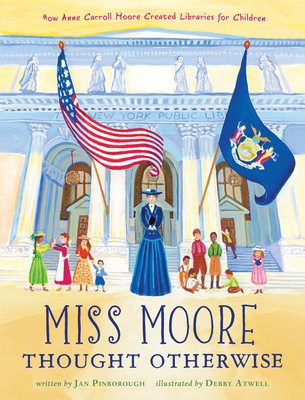 Learn the true story of Anne Carol Moore, the first children’s librarian in the United States! Told in lovingly crafted prose and Miss Rumphius-esque illustrations, this is a perfect read for both history and book lovers. "This makes an ideal addition to women's history units." "A concise, breezy chronology. Atwell's folk-art style acrylics capture a sense of history in the making, as well as the book's themes of excitement and change." "Atwell's cheery, doll-like figures and joyful colors are a good match for the woman who insisted that children's library space should be vibrant and stimulating."